Nothing says awesome quite like a dinosaur, especially a super predator dinosaur like an Acrocanthosaurus atokensis. Acrocanthosaurus was a large carnivorous dinosaur from the early Cretaceous period, with amazing strength of character. Like all dinosaurs, Acrocanthosaurus had a fierce ability to survive despite the odds against her. She thrived for over 10 million years.... let me say that again: Acrocanthosaurus was so amazing she saw her flock alive, well and fierce for 10 million years. Not 10 years, not 10 decades, not even 10 centuries... she gave the world attitude fueled strength for 10 MILLION years. Talk about a dinosaur species that knew how to live, and live well with strength and adaptability. If these amazing dinosaurs could thrive for 10 million years, maybe we should stop calling dinosaurs slow and archaic, because it is time to recognize that they lived with fierce strength for a time so long we simply cannot comprehend it as humans. Be fierce, be adaptable, and thrive in the world with the strength of the dinosaurs. Limited edition of 2,389 excellently crafted fine art watercolor reproductions for distinctive individuals who appreciate the true awesomeness of dinosaurs. Once they are gone, they are gone for good... so make sure to get one (or two!) while you can for your dinosaur paleo art collection! Unframed dinosaur art prints are protected with art sleeves and shipped rolled in a tube. Framed dinosaur art prints are boxed like Fort Knox, and once unwrapped, are ready to hang immediately so your home will be filled with the distinctive dinosaur fierceness of Acrocanthosaurus. An Acrocanthosaurus grins and shows off her teeth in the distant past. The Acrocanthosaurus atokensis watercolor painting is part of the Dinosaur Collection of paleo art by Kristen Girard. You can purchase each print framed or unframed. Custom hand-made frames are specially chosen by the artist to make each artwork look stunningly beautiful for years to come. 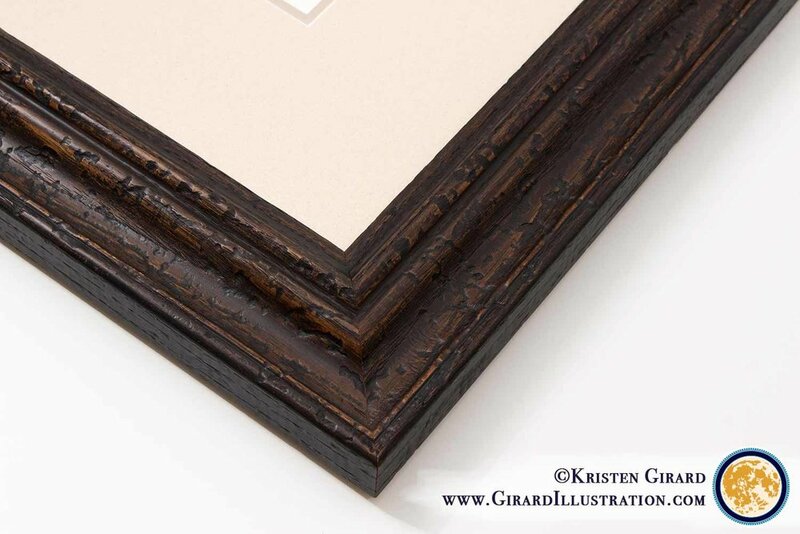 Each framed artwork is framed using only the highest quality materials available to ensure that your artwork is stunningly beautiful and can stand the test of time. Twisted Wire Mount - A superior hanging solution that helps the artwork hang straight!